On 19 May, St George’s Chapel, Windsor, will see another royal wedding in the long line of marriage ceremonies conducted there featuring royal brides or bridegrooms. There was some surprise expressed initially at the choice, but in fact St George’s – along with other private royal chapels and even palace drawing rooms, locations more usually associated with American than British marriages – have been more usual venues for royal marriages than Westminster Abbey or St Paul’s Cathedral. For much of the eighteenth and nineteenth centuries, royal marriages – even of monarchs and their immediate heirs – were not considered to be state occasions. Queen Victoria married her beloved Albert in the Chapel Royal in St James’s Palace, where George III married Charlotte of Mecklenburg-Strelitz. When the later George V married Princess Mary of Teck in 1893, public interest in the occasion was acknowledged for the first time in modern history. The crowds and the newspapers were permitted to have a glimpse of the royal couple on their short trips from Buckingham Palace to the Chapel Royal at St James’s Palace and back. But it was the marriage of the highly popular Princess Patricia of Connaught in February 1919 which started the more modern habit of royal weddings being seen as public (though not strictly state) occasions. Hers was the first royal wedding at Westminster Abbey in over 600 years. But in marrying at St George’s Chapel, Prince Harry and Meghan Markle both acknowledge there is no state dimension to their wedding (he is sixth in line to the throne currently, with the potential to move down further), which gives them the opportunity to tailor the wedding more to their own individual styles. Interestingly, the reception in Windsor Castle immediately after the wedding is going to be very much in the tradition of many British weddings of the late nineteenth and twentieth century. There will be no formal wedding breakfast, with a sit-down meal, but instead a more informal arrangement with the food being more of the canapé type, carried around to the guests who will have a greater chance to mingle and chat as a result. Harry and Meghan are choosing, very clearly, to do what will make an enjoyable occasion for them rather than following expectations of weddings which do have those state overtones. We know, now, that Meghan Markle’s father will not be able to travel to the UK to give his daughter away but her mother will be there, and there is certainly a very good precedent in royal weddings for the bride to be given away by her mother. The widowed Queen Victoria did it for three of her daughters. There is much speculation about the wedding dress and how much it will cost, which will only be resolved on the day itself. But personally, I shall not be surprised if it turns out to be much simpler and less expensive than many rumours have had it. Equally, I would not be surprised if she eschews a tiara and goes for something more individual. When it comes to bridal attendants, Meghan has chosen not to go with the American tradition of a Maid or Matron of Honour – and has instead preferred a more British tradition of sticking with child attendants. It is expected that, on the morning of 19 May, the Queen will announce a ducal title for Harry – as happened with his brother, Prince William, when he became the Duke of Cambridge. 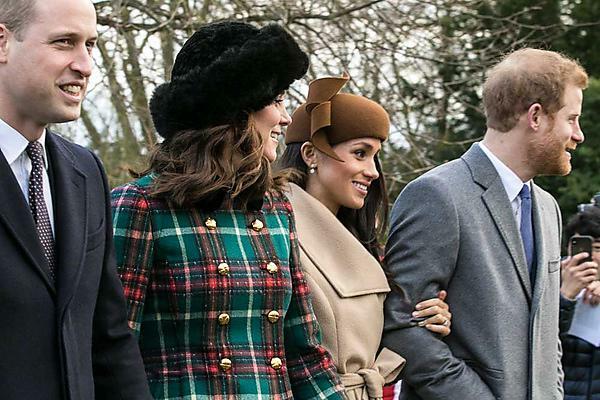 The hot favourite is the Dukedom of Sussex, which has been in abeyance since 1843 when Prince Augustus Frederick , sixth son of George III, died. It would in many ways be an apposite choice – like Harry, Prince Augustus was not a conventional royal, but one determined to carve his own way. Like Harry, he married a commoner (twice, in fact, after the death of his first spouse), but less happily than this time. Prince Augustus was interested in art, philanthropy, science and his genial character made him the favourite uncle of Queen Victoria. This wedding also follows in a long line of Anglo-American marriages in high life and they have been very much the stuff of celebrity. American duchesses in the UK peerage included Consuelo Vanderbilt, Duchess of Marlborough, Consuelo Yznaga, Duchess of Manchester, and May Goelet, Duchess of Roxburghe. They include Plymouth’s Nancy Astor, born Nancy Langhorne in Virginia, who became Viscountess Astor and Britain’s first woman MP to take her seat in the Houses of Parliament. All of these women were admired, celebrated in the media of the day and became an important element in Anglo-American relations. They played a real part in developing trans-Atlantic relations in the late nineteenth and early twentieth centuries, and were leading ‘soft diplomats’ of their day. It is interesting to speculate on the potential for a closer and more enduring Anglo-American relationship, not dependent upon political whims and vagaries, as a result of the union of Prince Harry and Meghan Markle. Do you see yourself working as a barrister or taking your legal skills into the business sector? Whatever your chosen path, we’ll work closely with you throughout your degree to help you set your career off in the right direction. All smiles for the sugar tax! Caring about the ‘foot’ in ‘football’ – how can England avoid injury scares? Helping women recover from drug addiction – can food play a part? How do we protect our native bee species? Labour markets under change: bullying and discrimination on the rise? Longer still to reign over us? Medical research funders, governments and research waste – are taxpayers getting ‘bang for their buck’? Stepping up to offer lifesaving care – why is podiatry important? Sugar and diet – a taxing problem? What next for our high streets? Why are the US and Iran in collaboration over Iraq? Why are we so fascinated with fireworks? Will the Taylor Review deliver ‘Good Work’?